This week I've made it my goal to make a menu and actually stick to it. I had gotten in a really good habit of doing that every week, and had kept it up for months. But then when my schedule changed at work a couple of months ago, my habit just kind of fell apart. Most nights we either pick up something that's easy to make (we particularly love Trader Joe's for that!) or just cobble together something random using what we have in the fridge or pantry. (For example, our meal last week of chicken fried rice, peaches, and guacamole and chips.) We're getting by, but I miss planning things out and actually cooking meals. I'm hoping things will get better in a few weeks when Abby goes back to school and we can settle into a more normal routine, instead of the crazy summer we've had! It's been tough trying to balance work, nursing school, day care, summer activities, vacations, and trying to keep up with running the household. Anyway, last night I made the first meal from my new menu, and it was a fabulous way to start off the week! 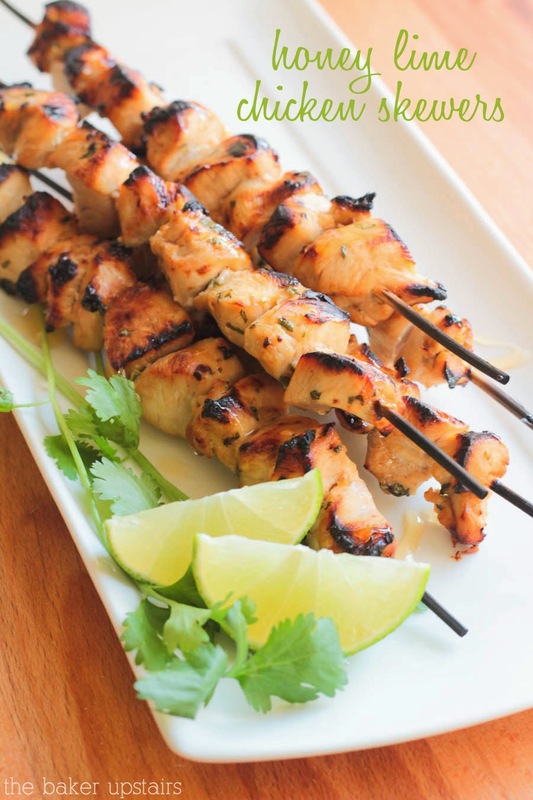 These honey lime chicken skewers were so flavorful and so easy to make. I think they would be awesome on a grill, but since I don't have one right now (boo apartments!) I just did mine under the broiler and they came out great. I drizzled them with a little extra honey when they came out of the oven, and they were fantastic. Both of my little girls ate every last bite of chicken, so it was definitely a recipe win! Whisk together all ingredients except chicken. Toss the chicken in the marinade and refrigerate for at least one hour. Thread the chicken chunks onto bamboo skewers. Grill over medium heat for 7-8 minutes, or until cooked through. Alternately, preheat broiler and broil for 6-7 minutes, then flip and broil for another 4-6 minutes, until cooked through. Drizzle with extra honey if desired. This looks great! Perfect for a summer bbq or picnic! I will have to try these, they sound wonderful!